Size of the Industry 12745 million tonnes of iron ore, 2,525 million tonnes of bauxite, 233 million tonnes of magnesite, 76446 million tonnes of limestone, 70 million tonnes of barites, 167 million tonnes of lead & zinc ore, 176 million tonnes of manganese ore and 90 million tonnes of chromite. Geographical distribution Major cities of India like Bombay, Karnataka, New Delhi, Hyderabad, Kerala, and Banglore. Indian Mining Industry has been a major mineral producer in Asia and globally. Currently it is the global producer of chromite, coal, iron ore and bauxite while enjoying economic growth during the nineties. Mining is over 6000 years old in India. 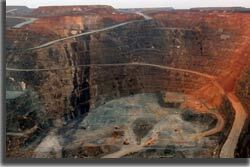 The oldest mines include lead-zinc mineral deposits at Zawar, copper deposits at Khetri, and gold deposits in Karnataka. The mining techniques used back then were much ahead of their time and technology specially the smelting techniques. A timeless example and monument of the mastery of the old times craftsmen is the Iron Pillar in the Qutab Minar complex in New Delhi. India's current state owned mining and benefitted companies have been facing drastic production cuts, resulting in operations becoming uneconomical which has eventually resulted in the closure of several mining operations. Reasons have been given as lower grade reserves and excessive manpower quotas for poor results. Since the initiation of National Mineral Policy in 1993, India has made good progress in attracting foreign investment in its mining sector, along with attractive incentives. The National Mineral Policy was revised again in 1994 and as a result, private investment (both domestic and foreign), has been permitted for the exploration and exploitation of the following minerals: Iron - ore, Copper, Manganese, Lead, Chrome ore, Zinc, Sulphur, Molybdenum, Gold, Tungsten ore, Diamond, Nickel and Platinum group of metals. To assist in the development of the country's mineral resources India has set up several governmental agencies like the The Geological Survey of India (GSI) which is the principal agency responsible for the assessment of geological and regional mineral resources of the country established in 1851 and is one of India's oldest investigative agencies in the field of earth sciences. Its areas of operation help the scientific surveys and research, for locating mineral resources. GSI office operates through six regional offices and four specialized wings - marine, coal geophysics, airborne surveys and training. Other one is The Indian Bureau of Mines (IBM) which is the principal government agency responsible for compiling exploration data and mineral maps and for providing access to the latest information in respect of mineral resources in the country. IBM has both regulatory as well as service functions. For any nation, Minerals constitute the back-bone for economic growth and India has been eminently and enormously endowed with this gift of nature. Since long time there are many evidences that exploitation of minerals like coal, iron-ore, copper, lead-zinc has been going on in the country from time immemorial. The first recorded history of mining in India dates back to 1774 when English Company was granted permission by the East India Company for mining coal in Raniganj. In 1880 M/s John Taylor & Sons Ltd. started gold mining in Kolar Gold Fields in Karnataka. In Digboi, Assam the first oil well was drilled in the year 1866 which was just seven years after the first ever oil well was drilled anywhere in the world viz in Pennsylvania State, USA in 1859. Mining activities in India remained primitive in nature and modest in scale until the beginning of the current century. Therefore, with progressive industrialization the demand for the production of various minerals gradually went up. After India became independent, growth of mining under the impact of successive Five Year Plans has been very fast and huge. There are ambitious plans in coal, metalliferous and oil sectors to increase production of minerals during the 8th Five Year Plan and thereafter. 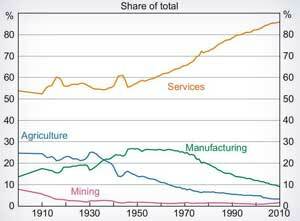 The GDP contribution of the mining industry varies from 2.2% to 2/5% only but going by the GDP of the total industrial sector it contributes around 10% to 11%. Even mining done on small scale contributes 6% to the entire cost of mineral production. Indian Mining Industry provides job opportunities to around 0.7 million individuals. India is the seventh largest country which extensively spreads over an area of 3.29 million square kilometers. The Indian mining industry is the backbone of Industries in the country. The mining industry is the main source of raw material for most of the industries producing as many as 84 minerals comprising 4 fuels, 11 metallic, 49 non metallic and 20 minor minerals. Today India has resources of 12745 MT of iron ore, 2,525 MT of bauxite, 233 MT of magnesite, 76446 MT of limestone, 70 MT of barites, 167 MT of lead & zinc ore, 176 MT of manganese ore and 90 MT of chromite. India has the largest reserves of barites in the world. Total value of mineral production of Indian Mining Industry is Rs. 568070 million in 2000-2001. The metallic production constitutes the iron-ore, chromite, copper-ore, zinc concentrates, manganese ore, gold, bauxite, lead concentrates. Amongst the non-metallic minerals, 90% of the aggregate value is contributed by the limestone, gypsum, barites, magnesite, dolomite, kaolin, apatite & steatite, phosphorite and fluorite. Indian Mining Industry produces many products which include a total of 84 minerals consisting of, 49 non-metallic industrial minerals, 11 metallic minerals, 4 fuels and 20 minor minerals. The products are like molybdenum, nickel, oil sands, palladium, Aluminium, coal, cobalt, copper, chromium, tantalum, tin, titanium, diamond, gold, iron ore, lead, manganese, platinum, silver, vanadium, tungsten, uranium, zinc, etc. The major workable coal deposits in India occur in two distinct stratigraphic horizons - Permian, commonly known as "Gondwana" coals and the Tertiary. 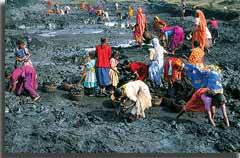 India's 99% coal resources are found within a great succession of fresh water sediments. The Indian major coalfields are represented by isolated basins which occur along prominent present day river valleys, viz., Damodar, Koel, Sone-Mahanadi, Pench-Kanhan, and Pranhita-Godavari. 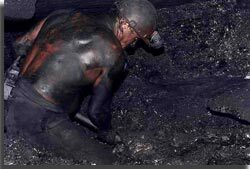 Country's nearly 50 coalfields, varying in size from a few km to to as much as 1500 km are known today, barring the small occurrences of coal along the Himalayan foothills. There are two categories of Indian bituminous coals namely, coking and non-coking. Coal exploration in India today is largely being carried out by conventional methods of systematic geological mapping followed by drilling, core drilling playing a dominant role. Today due to the modern exploration techniques like photo-geology, remote sensing, and non-coring drilling, geophysical surveys etc. are used for detailed and precise exploration. In the year 2007-08, the Export value of ores and minerals was US$ 20.44 billion. Diamond (mostly cut) was the principal item of exporting which accounted for 60 per cent, followed by iron ore with a contribution of 24.6 per cent, granite 4.51 per cent, Zinc ore and concentrate 1.35 per cent, chromite 1.29 per cent, Bauxite 1.24 per cent and alumina 1.07 per cent. In the year 2007-08 important minerals being exported were building and monumental stones, emerald, coal (including lignite), marble, etc. PPCL - Pyrites, Phosphates and Chemicals Ltd.
HZL - Hindustan Zinc Ltd.
HCL - Hindustan Copper Ltd.
BGML - Bharat Gold Mines ltd. This sector has opportunities knocking at the door for skilled professionals who would be very much familiar with the Mining patterns of the Country. Due to the amendments in the MM (R&D) Act & Mines and Minerals (Regulation and Development) Act in 1996, opening up of private players by the government has taken various steps to encourage the investments in the sector. With the recent formation of the New National Mining Policy in place, the Ministry of Mines plans to attract investments of Rs 1,00,000 crore in the mining sector. Indian Mining Industry is classified under the category of "Red" for pollution which represents highly polluting industries. India today has the capacity to produce 86 minerals which include 4 fuels, 10 metallic, 46 non-metallic, 3 atomic and 23 minor minerals & si the leading producer of mica blocks and splitting. The powerful economies in world around Asia, India and China are trade partners in some of the most vital metals, minerals and other such resources are very much needed for the economic growth. India today has been able set up companies by going abroad and acquiring other firms with similar profiles and is also investing in their assets overseas. Indian Mining Industry is making its presence felt across the globe, for instance from an offshore oil field in Australia to a steel company in Thailand. Amongst the Indian private players, Reliance Energy Limited (REL) owned by Anil Ambani is exploring the options of getting the coal mines in Indonesia and Australia. These efforts usually meet the requirements of coal as raw material for its upcoming projects in Uttar Pradesh and Maharashtra. REL's total investment would be of around $ 500 million if this deal under consideration gets finalized.